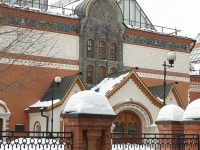 The Tretyakov Gallery houses some of the great masterpieces of traditional Russian art from before the Revolution and has the world's finest collection of Russian icons from the 11th to the 17th-centuries. The gallery's collection of paintings, graphics and sculptures covers Russian art from the 18th to the 20th century. The gallery was named after its founder, Pavel Tretyakov, an art collector who donated about 2,000 works of art from his private collection to the city of Moscow, forming the basis of the collection to which state acquisitions were later added. He also donated his own house, which became the original site of the art gallery. Two separate buildings at different locations house the works selected for display. Address: Lavrushinsky Ln, 10, Moscow, Russia. Transport: Take to metro to the Tretyakovskaya metro stop, and walk for 317 yards (290m). Opening times: Tuesday, Wednesday, and Sunday: 10am to 6pm. Thursday, Friday, Saturday: 10am to 9pm. Admission: Adults: RUB 500. Minors enter for free.